Another day, another ornament! I keep having these ideas pop into my head while I’m doing something else and I just have to try them. This one is another gift for someone and it turned out to be pretty easy. Well, sewing a circle that you’re going to stuff is not really that easy, unless you’re satisfied if it doesn’t turn out perfectly round. However, to be honest, this doesn’t really have to be round, it could be square, or randomly shaped, or if you’re creative it could be shaped like *something*. But I wanted this to be quick and easy. I used some of the leftover fabric from the gift bags I’m making and decided to make the opposite sides different, just to make it more interesting (this ornament is going to a boy and altho it’s not classically boyish, I think it’s *interesting* enough and not girlie). I used a big ribbon spool to draw a circle on one piece of the fabric and cut both pieces at the same time (cutting them about a quarter inch larger than the circle I drew). Next I simply placed the “right” sides facing each other and sewed around, leaving an opening about half an inch so I could turn it and stuff it. THIS is the hard part as I’m not that good yet at sewing where I intend to sew and turning in a circle is a little tricky for me, but it was mostly roundish. I stuffed it with some leftover batting from another project (and you know, if you have any old pillows you want to just get rid of, wash them first and save that batting and reuse it for other things, batting is kind of pricey!). Last, I took some cording that I’ve had forever that’s really pretty. I bought it for wrapping gifts but hardly use it anymore because It usually end up buying things online these days. I just stitched it around the edge (not nearly as difficult as it sounds and it took about 10 minutes tops, I promise). 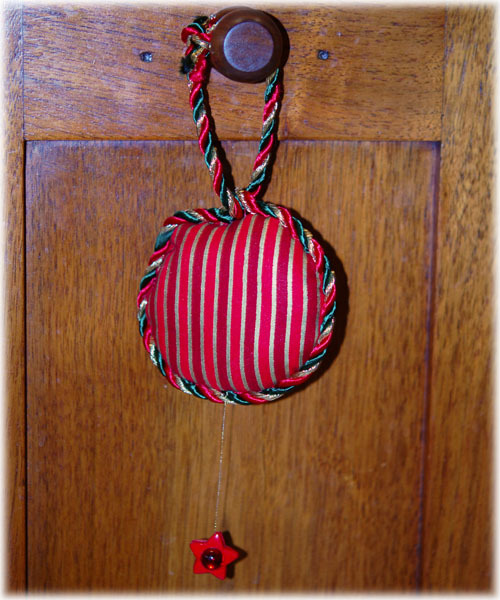 Just be sure to leave enough on what you are going to use as the top to tie once (not a knot, just one over and under) and then make a loop for a hanger and tie a knot at the top. If you have a twisted cord like I did you will have to cut it close because it will unwind. It’s 2 star shaped buttons hot glued together with a piece of metallic gold thread sandwiched between them. Be careful when you do it that you get the thread where you want it so the buttons will hang the direction you want them to (just put a little thought into it). Then I took those little glass drop things that you find at craft stores in the jewelry section (I think–I’m sorry I have all this stuff that I can’t recall where it came from anymore!) and hot glued them over the button holes. You could use beads or something else. Whatever floats your boat. I admire your work, I can not sew, I tried one day and the easiest point was a disaster hihi! But I do not own myself defeated, hihi, I will try again. The decoration is beautiful, you know how I love Christmas decorations! the boy who will be glad to receive it, I’m sure. Well done my friend ! That is a very cool ornament! I love it and so will Bobby. That will look awsome on the tree. I’m wandering if there is a way to put a cloth photo in the center. Merry Christmas. Oh it will be nice with a photo, a good idea again ! 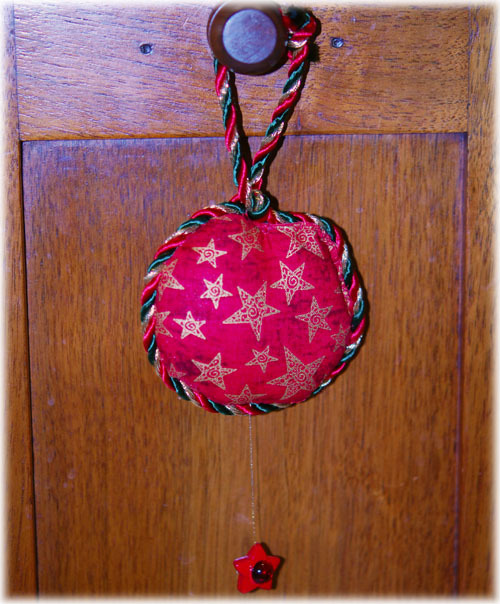 My ornament is on my blog now ! I hope you will like it !